Does eBay know something that we don’t? 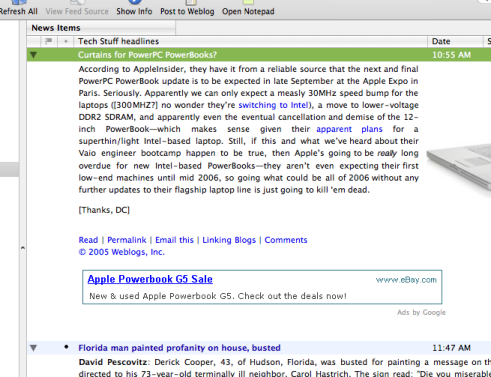 Update: The Inquirer has a few more details on the PowerBook G4 update front. They’re pointing fingers at the Freescale MPC8641, the single-core version of Freescale (formerly Motorola’s chip division)’s dual-core G4. The chip includes a RapidIO FSB, on-chip network and PCI-E controllers, an on-chip dual-channel DDR2 controller. Other reports have suggested that Apple’s going to use Freescale’s 7448, which seems to be the same basic chip, only without the on-board memory controller, PCI-E, networking, or RapidIO, and with a 200 MHz FSB instead. It goes without saying that I’d love to see the dual-channel MPC8641D in a PowerBook, but that’s probably asking way too much from Apple.